As Allyson said, “the CSA model is the most efficient way to get vegetables to people.” For the shareholder, that efficiency means that they pay less for those vegetables than they would in the store or market. Meanwhile, the advanced purchase of the farm shares gives a local farmer “seed money” to start the season. From a health perspective, the vegetables that CSA members get are far fresher and more nutrient dense than grocery store vegetables because they have more time on the plant than vegetables that are picked before they are ripe. Shareholders also get to taste and sample varieties of vegetables that often do not make it to the grocery store. When I was talking to Allyson, she pointed out that CSA systems also provide people with an opportunity to connect with the farm and to see where their food comes from and how it grows. Most members pick their share up at the farm every week and gather at the farm for events like community harvest breakfast, mother’s day flower bar, planting and pizza day and the end of season potluck. The farm hosts an annual “Meet the Farmers/Open Farm Tour” which is coming up on May 11th. 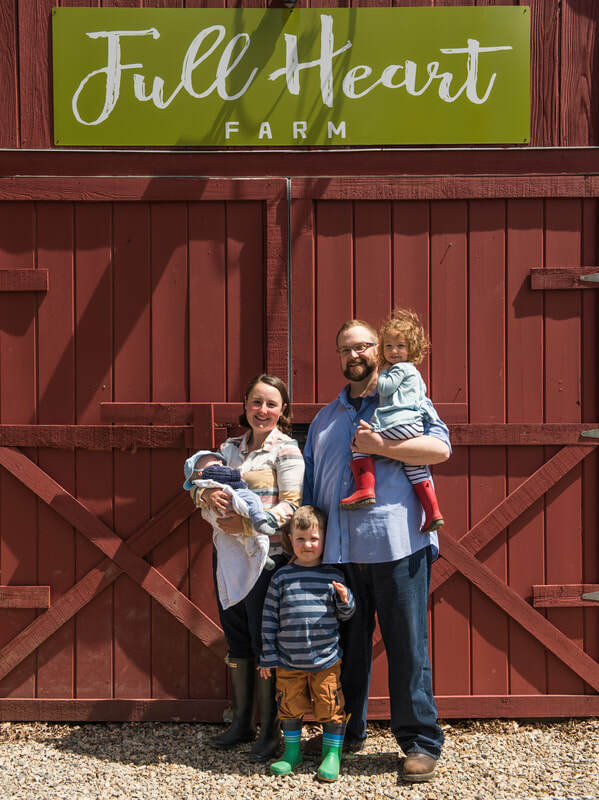 Full Heart Farm has a welcoming, peaceful atmosphere which is a reflection of Allyson and her family. Allyson became a farmer after she went to college for magazine layout. She noticed a draw towards farming so she decided to spend a semester in Italy working full time on a farm to see if she liked farming enough to make it her life’s work. She wrote:” I fell quickly in love with the incomparable joy that comes from producing a tangible product. I was enamored with the tiny miracles happening all around me, as seeds turned into food that tasted better than anything I had ever eaten. The solution to so many of our country’s health and environmental problems became clear to me: eat more local food. And I was hungry to be a part of the solution.” Her experience in Italy confirmed her love of farming and from then on, she had the goal to start a sustainable farm. She worked on many different kinds of farms including a dairy farm and a livestock farm before coming back to Connecticut to be closer to her family. Allyson looked at lots of properties but the one that ended up working out was in Ledyard only a few miles away from her childhood home. Allyson says “it’s the eating part of farming that I like the most.” She shares a true love of vegetables “because they are delicious and they make me feel good.” She notices that a lot of people carry a feeling of eating vegetables being somewhat of a chore and, through sharing recipes and preparation techniques, she likes to help members experience the flavors of many different vegetables and discover new ways of enjoying vegetables. When she first started providing farm shares, Allyson provided meal-based shares which meant that people would pick up a bag that contained everything they needed to make one meal per week. (This same idea has been popularized by meal kit companies like Blue Apron). Now she works to provide a mix of familiar vegetables with a few new vegetables or varieties to try every week “to make cooking more exciting.” Allyson encourages members to challenge their preferences because they frequently discover that they love eating a vegetable that they formerly thought they did not like. For example she says “a roasted beet is nothing like a canned pickled beet. A lot of people think they don’t like beets if they don’t like the slosh of the canned pickled beets.” The CSA model provides an opportunity to increase the quantity of vegetables in your diet and shareholders are often surprised by how their experience as a CSA member increases the variety of vegetables that they enjoy and feel comfortable preparing. As an integrative physician, I often tell patients that eating 5-6 cups of vegetables per day is foundational to health and prevents everything from heart disease to Alzheimer’s and cancer. I spend a lot of time helping people find ways to increase their vegetable intake and I am inspired by the way Allyson provides her CSA members with delicious, fresh produce and by how she shares her creativity and love of farming with the community. 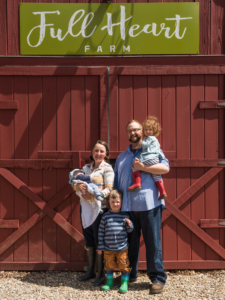 If you want to learn more about Full Heart Farm and meet Allyson and her family, you can attend their Meet the Farmers/Open Farm Day on May 11th or sign up for a farmshare through their website.